Classy and trendy, this contemporary handle pull by Richelieu can easily integrate into any dicor to provide an updated look to kitchen cabinet doors and drawers. This simple V-shaped pull will add a touch of contemporary elegance to any dicor. Its unique shape provides distinct change to furniture and cabinets. This contemporary streamlined pull will add simple elegance to your dicor. This certified product will give existing furniture and cabinets an instant upgrade. 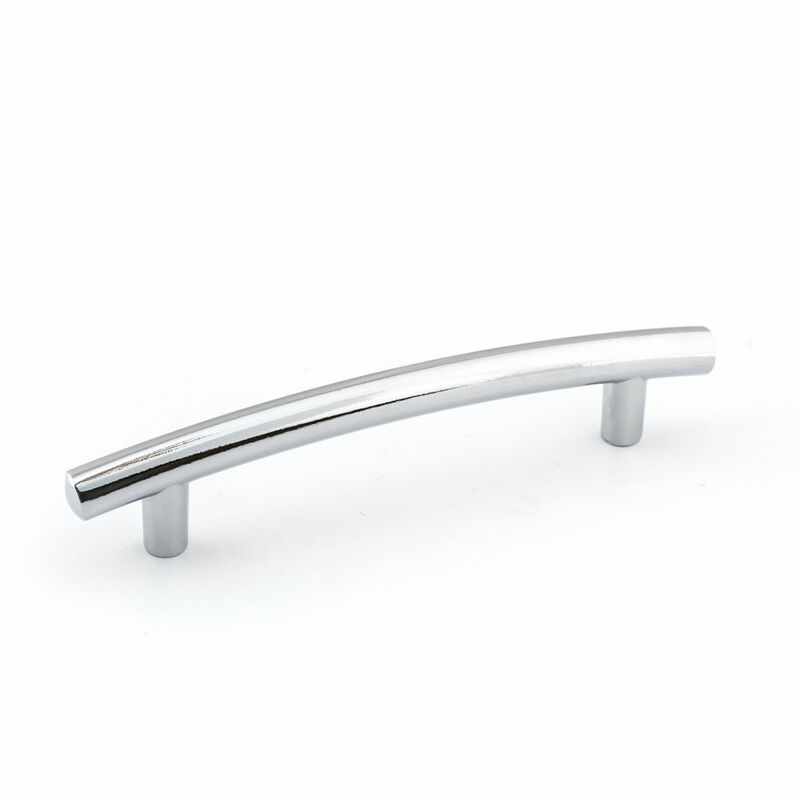 Traditional Metal Pull 3 3/4 in (96 mm) CtoC - Chrome - Nîmes Collection Add functionality and beauty to your cabinetry with the Richelieu Hardware 3-3/4-inch Chrome Bar Pull. It's made from metal to withstand wear and tear and features a simple, modern design that will add a contemporary look to your home. Traditional Metal Pull 3 3/4 in (96 mm) CtoC - Chrome - Nîmes Collection is rated 4.0 out of 5 by 5. Rated 4 out of 5 by jsurfers from Pull was as expected and looks great, screws were too short so had to use different ones, many pu... Pull was as expected and looks great, screws were too short so had to use different ones, many pulls provide two sizes of screws, this one didn't. Also, shipping time seemed excessive, although I wasn't in a hurry to receive the item so worked great for me. Rated 5 out of 5 by Handles from Handles look great on my husband's new garage cabinets! Handles look great on my husband's new garage cabinets! Rated 5 out of 5 by Brickhouse from Solid! This is a good solid piece of hardware. It's streamline line in appearance yet sturdy. A perfect blend of beauty and function! Looks absolutely stunning in our bathroom. If our bathroom were Audrey Hepburn in that black dress, this hardware is her necklace and earrings. Rated 1 out of 5 by Anonymous from Disappointed Once Received Overall the product looked like the picture, but once seen and felt in-person, they seemed cheap and I ended up returning. The pulls were extremely light weight and felt like plastic. Found other pulls for slightly more which felt much heavier and were metal. Rated 5 out of 5 by Mimi from Expensive looking pull Used these in a bath remodel and loved the results. They are light weight but appear to be heavy. Richelieu makes quality products for the money. Would not hesitate to use again. Remember to use screwdriver not a drill to attach to the cabinet! Our contractor thought he would save time with the drill and ended up cross threading the screws. Resulted in broken screws and pulls.